For Paradise drivers, Tucker’s Collision Center is the place to go for quality automotive repair at a competitive price. Are you from Paradise, NV or the surrounding area? Then Tucker’s is the place for you to go and experience the best locally owned shop in the area with decades of experience and expertise. We are conveniently located at 5140 S Cameron St, Las Vegas, NV 89118. In just a short fifteen minute drive, you’ll find yourself at our shop and in the hands of the best technicians! 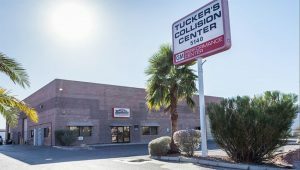 When you arrive at Tucker’s, our friendly staff will greet you, listen to any questions and concerns, assess the vehicle, give you an estimate, and then begin working on your vehicle without delay. We’ll get the work of minor repairs done quickly and efficiently, and then let you get back to your busy day. Make yourself comfortable in our customer lounge while we restore your vehicle to exact factory specifications using only the best parts and products. If your vehicle requires more extensive repairs, schedule an appointment with our service team today! We offer full collision repair services here at Tucker’s. Our experienced technicians are trained and equipped to service all makes and models. We will always restore your car, truck, van, or SUV to factory specifications. We are committed to helping you extend the life of your vehicle and providing you with the absolute best in customer service. We’ll offer reliable, affordable solutions to get you back in your vehicle as quickly as possible and we’ll have everything looking and running like new. Trust Tucker’s Collision Center with all your auto repair needs. All Paradise area drivers are welcome and we look forward to your visit!